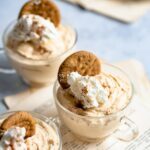 Peanut Butter White Chocolate Mousse Recipe made with creamy peanut butter and white chocolate chunks. Mousse sweetened with brown sugar and butterscotch. Place egg whites in bowl of stand mixer and beat on medium high with whisk attachment until stiff peaks form. Gently transfer egg whites to a separate bowl. Melt your white chocolate and butterscotch together. I use a microwave safe bowl and stir every 30 seconds until melted, for about 1.5 minutes total heat time. Stir the peanut butter and egg yolks in with slightly cooled melted chocolate. Pour cream into bowl of stand mixer and combine with chocolate peanut butter mixture. Whip the cream and chocolate peanut butter together to form stiff peaks. Slowly fold the stiff egg whites into chocolate peanut butter cream with a spatula. Spoon your mousse into clean glasses. Chill for about 2 hrs before serving.